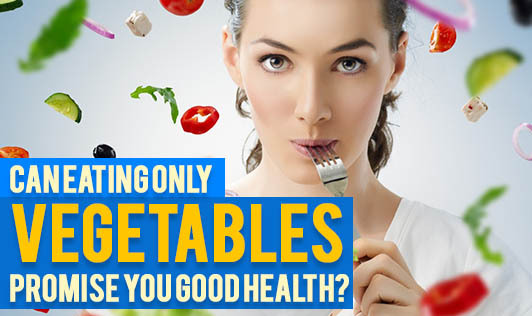 Can Eating only Vegetables Promise you Good Health? Every Nutritionist or Doctor you talk to, urges you to start your meal with a bowl of salad. A few so-called wise folks who are looking for quick fixes for weight loss take this as ‘the mantra' of weight loss and eat only vegetables as meals. So all you weight watchers, read below to know if eating only vegetables can promise you good health and help you achieve your health goal. Let me first dig into the benefits of vegetables. They are rich in fiber, antioxidants, assorted vitamins and minerals. Fiber as we all know is important to cleanse the intestine and stimulate regular bowel movements. Antioxidants carry a lot of health benefits including protection against tissue damage, prevents a variety of lifestyle disorders etc. Vitamins are essential to maintain normal immune function, tissue repair, metabolism, red blood cell production and many such body functions. Minerals are important for enzyme production, immunity, muscle function and strong bones. Vegetables fail to provide you those essential macronutrients viz carbs, proteins and fats which gives you energy and keeps you on your toes during all those hectic days. A few vegetables like celery, carrots, cucumber and lettuce are also considered as negative calorie foods as the energy required to digest these veggies are more than the calories provided by them. A few vegetables like spinach, asparagus and broccoli do contain proteins but pale in comparison with the proteins in meat, milk and milk products. Essential fatty acids, again lacking in vegetables, are important for the formation of cell walls, and steroidal hormones. Moreover, fats in general are essential for insulation and breakdown of fat soluble vitamins. So, you now know the importance of proteins, carbs and fats that your bowl of vegetables falls short of. The message in this article doesn't need to further explain that a combination of food groups taken together only can help you stay fit, lose weight and in turn, gift you good health. No single food group can help you achieve your health goal. So, all of you out there who want to replace your meal with a bowl of salad or sprouts or fruits, it's high time you swap the idea with a balanced meal!